It’s been about six months since I originally played The Order: 1886 at E3, and between then and my trip to the PlayStation Experience, I had started to get cold feet regarding my initial praise. The game sure looks gorgeous and cinematic, but after I re-watched old footage and thought about what I’d played of the game more, I was getting very worried that the game would turn out to be nothing but a trite third-person shooter that just happened to be really, really pretty. After playing what Ready at Dawn brought to the PlayStation Experience, I’m now, once again, a believer. Unlike E3’s demo, my time with The Order: 1886 benefited greatly by clocking in something around 30 minutes instead of the, at max, 15 I got before. In the half-hour I played the game, I took on the role of Sir Galahad once more as he and his squad, members of the order the game’s title refers to, infiltrated a zeppelin where enemy forces were attempting to assassinate a man who appeared to be a politician. As Galahad and company were beginning their initial climb down the side of the zeppelin, I was immediately caught off-guard when I realized the characters in the game were waiting for me to initiate their descent. This surprise came from the game’s seamless transition between cutscene and gameplay. Constantly I was holding on to my controller because I never knew just when the game would need me to act. There were a lot of actions I expected The Order to have occur in a cutscene only to find myself needing to do them through a QTE, minigame, or just by taking direct control. Examples included the aforementioned climb down the side of a zeppelin, a lockpicking minigame and even, mid-cutscene, press a lever in the middle of a conversation between Galahad and his superior. The Order is blurring the line between playing a game and watching it, and that’s something I find very exciting. As the zeppelin segment was one that required discretion, I was also surprised to see that The Order: 1886 has some elements of stealth. The stealth is between Uncharted’s simplicity and a Splinter Cell’s difficulty, as it shakes up stealth kills with timed QTEs instead of simple one-button executions. Assassinating an enemy requires not only being inconspicuous, but also timely as the game only allows you to successfully kill enemies within a certain window of the game’s prompt. Failing to do so results in an instant death as you’ll be caught immediately after. Sir Galahad: skilled in shooting, stealth, and survival. 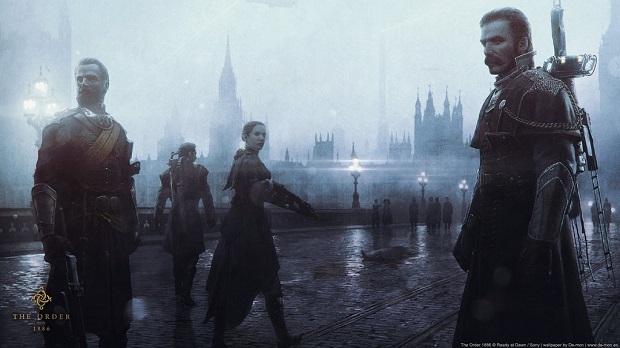 There’s a lot more going on in The Order: 1886 than I initially believed. The variety Ready at Dawn is showcasing has me excited for the game again. After the culprits were found and taken out, The Order did feature the shooting sequences seen in the original demo. Galahad does seem to handle guns pretty shakily, and there’s no option to hold your breath in order to get a steadier aim. The Order is coming out in two months, so I don’t see that being fixed before the game ships. Hopefully it doesn’t grow to be too much of a frustrating issue, because with shooting as core to the game as it appears it could really become a hindrance to that type of combat. The Order: 1886 appears to be blending gameplay and cinematics, stealth, shooting, and even horror genres, and is coming off more varied than it has in the past. I’m glad to see the game’s proving to not be the one-trick pony I feared it was. I can safely say that my excitement for the game’s February 20th release date is rising, if nothing else.